For other people named George McCrae, see George McCrae (disambiguation). McCrae was the second of nine children, born in West Palm Beach, Florida. He formed his own singing group, the Jivin' Jets, before joining the United States Navy in 1963. Four years later, he reformed the group, with his wife Gwen joining the line-up, but soon afterwards they decided to work as a duo, recording for Henry Stone's Alston record label. Gwen then won a solo contract, with George acting as her manager as well as doing some singing on sessions and in clubs in Palm Beach. He was about to return to college to study law enforcement, when Richard Finch and Harry Wayne Casey of KC and the Sunshine Band invited him to sing the lyrics for a song that they had recorded for the band, but could not reach the high notes that were required for the song. The original intention was that Gwen, his wife, should record it, but she was late for the session and George recorded alone. It suited his high-pitched voice to the extent that the song, "Rock Your Baby", became one of the first hits of the disco era in 1974, selling an estimated eleven million copies worldwide, topping the charts in the U.S., UK. The song was so successful that Rolling Stone magazine voted it the #1 song of the year in 1974. McCrae received a Grammy Award nomination for Best Male R&B Vocalist the following year. Two further single releases, "I Can't Leave You Alone" and "It's Been So Long", taken from his album Rock Your Baby, also reached the UK Singles Chart Top 10. He recorded several further albums for TK, including George McCrae (1975) and Diamond Days (1976), and also continued to record with, and manage, his wife until their divorce in 1976. While he continued to record albums including We Did It! 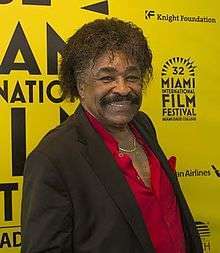 and his second self-titled album George McCrae (both 1978), his commercial popularity slipped as the decade progressed. He remarried, moved to Canada, and entered a period of semi-retirement, leaving TK at the end of the 1970s. He returned with the album One Step Closer to Love in 1984, the title track from which entered the charts in Britain, Canada and Holland. He moved to the village Munstergeleen in The Netherlands and remarried again in the late 1980s. His later albums found some success in Europe, and he continued to perform regularly there. By the 2000s he shared his time between homes in Florida, Aruba and the Netherlands. "I Can't Leave You Alone"
"I'm Gonna Stay With My Baby Tonight"
"Kiss Me the Way I Like It"
"(You've Got) My Love, My Life, My Soul"
— — — — — — — — — — — — We Did It! "I Want You Around Me"
"Don't You Feel My Love"
"One Step Closer (To Love)"
"Rock Your Baby (Frankfurt Mix)"
"All Around The World (The Fresh Taste Of Happiness)"
↑ "George McCrae Discography". Discogs.com. 1944-10-19. Retrieved 2015-08-27. 1 2 3 "Biography by Bill Dahl". Allmusic.com. Retrieved 18 February 2009. 1 2 Archived December 27, 2008, at the Wayback Machine. 1 2 "The Encyclopedia of Popular Music - Colin Larkin". Books.google.co.uk. 2011-05-27. Retrieved 2015-08-27. 1 2 3 4 5 "Longing for... - George McCrae - World wide ambassador of Love". George McCrae. Retrieved 2015-08-27. ↑ Murrells, Joseph (1978). The Book of Golden Discs (2nd ed.). London: Barrie and Jenkins Ltd. p. 347. ISBN 0-214-20512-6. 1 2 Roberts, David (2006). British Hit Singles & Albums (19th ed.). London: Guinness World Records Limited. p. 338. ISBN 1-904994-10-5. ↑ "George McCrae - Rock Your Baby (Vinyl, LP, Album)". Discogs.com. 2015-01-05. Retrieved 2015-08-27. 1 2 Archived June 6, 2014, at the Wayback Machine. 1 2 "George McCrae | Awards". AllMusic. 1944-10-19. Retrieved 2015-08-27. ↑ "George McCrae - US Hot 100". billboard.com. Retrieved 8 February 2015. ↑ "George McCrae - New Zealand Chart". charts.org.nz. Retrieved 8 February 2015. ↑ "George McCrae - German Chart". officialcharts.de. Retrieved 8 February 2015. ↑ "George McCrae - Austrian chart". austriancharts.at. Retrieved 8 February 2015. ↑ "George McCrae - Swiss chart". hitparade.ch. Retrieved 8 February 2015. ↑ "George McCrae - Dutch chart". dutchcharts.nl. 8 February 2015. ↑ "George McCrae - Belgian Chart". ultratop.be. Retrieved 8 February 2015. ↑ "George McCrae - Swedish chart". swedishcharts.com. Retrieved 8 February 2015. ↑ "George McCrae - Norwegian chart". norwegiancharts.com. Retrieved 8 February 2015. ↑ "George McCrae - UK Chart". The Official Charts Company. Retrieved 8 February 2015.